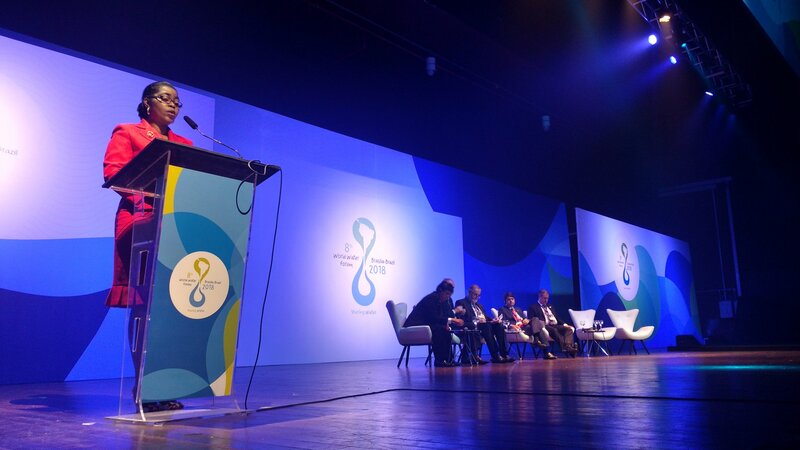 The 8th edition World Water Forum, the world largest event on water in the world, is taking place in Brasilia from 18 to 23 March, gathering a high number of delegates involved on the water and sanitation management at all levels. The mission of this year’s edition is to promote awareness, build political commitment and trigger action on critical water issues at all levels especially considering the implementation of Sustainable Development Goal (SDG) 6. In the framework of the World Water Forum, the International Conference of Local and Regional Authorities, co-organised by UCLG, the World Water Council (WWC), the Global Water Operators' Partnerships Alliance (GWOPA), the National Confederation of Municipalities of Brazil (CNM), the International Council for Local Environmental Initiatives (ICLEI) and the Secretariat of Federal Affairs of Brazil gathered 400 leaders and practitioners to reach recommendations on how to intensify action at all levels in order to leave no one behind in water and sanitation goals. UCLG, as co-organiser of the International Conference, mobilised a delegation of 40 mayors and governors, co-lead by Iván Arciénega, Mayor of Sucre, President of FLACMA and Vice-President of UCLG, and Rose Christiane Ossouka Raponda, Mayor of Libreville and Vice-President of UCLG. Many municipalities face tremendous challenges regarding water management, water scarcity, and the impact of climate change on water resources as well as in providing clean water and sanitation services to all citizens and the Forum counted with a high participation from local and regional elected officials from Latin America, particularly Brazil, Argentina, Chile, Colombia and Africa, especially Kenya, Benin, Gabon, Botswana, Malawi, Senegal, Mauritania, Morocco and Sao Tomé who conveyed that message of alert to the world. UCLG moderated the plenary session of Tuesday 20th March entitled “From local water governance to the international agendas” where participants discussed the political nature of water resource management and hence, the need for sound governance. Maria do Rosario, Mayor of Caninde underlined the strong challenge faced by the municipality in terms of water shortages. 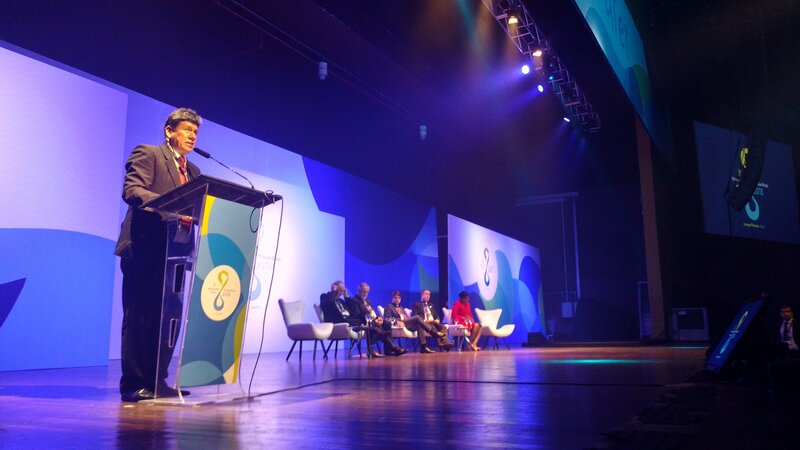 For his part, Maurício Brusadim, the Secretary for Sustainability of the State of Sao Paulo made a plea on investing in technology crucial in order to increase the access to water onthe territory of the State. Martin Moyo, Mayor of Bulawayo, Zimbabwe, referred to the important water shortages in the second largest city of Zimbabze and the investment needed in infrastructure. To conclude, Thierry Burlot, Vice-President of the Brittany Region emphasised that one important tool for planning has been the creation of the Grand Bassin, a translocal agency on water going beyond institutional boarders and added "water is fundamental for solidarity and for conciliation of activities". Later in in the day the breakout session “Reinforcing local governments' capacities on water provision” explored different dimensions on how to reinforce governance on water. Local and regional authorities are the principal actors accountable for the governance on water and have a specific role of convener with other stakeholders and especially civil society actors. The session also tackled the efforts made in Brazil in particular in terms of legislation and cooperation with the juridical sector. Throughout the Forum, local and regional leaders recalled that local and regional authorities are the central actors regarding management of water and sanitation. The issue of municipalisation of water and sanitation services was put on the table and had a central role in the discussion. In order to ensure that the needs of the communities are met, local and regional governments should have a stronger role regarding decisions on water management. During the plenary sessions of the Conference, mayors and governors underlined the need to promote decentralized cooperation between local governments as well partnerships between all levels of governments. International and regional support should be provided to training centres and programmes to strengthen capacities of local governments and service providers and improve provision on water and sanitation. Participants all agreed that climate change will have an impact on the entire water cycle and on the citizens of our communities: it will make water scarcer, increase the risk of extreme natural events such as floods and droughts, limit the renewal of groundwater reserves, cause rising sea levels and temperatures and make rainfall patterns and the regimes of rivers more unpredictable. In this respect, the responsibility for SDG6 on access to water and sanitation for all falls principally to local authorities and cannot be achieved without good local governance, the sustainable management of natural resources and effective urbanization. Mayors and governors recalled that effective local-level water management is critical to the achievement of all global goals. The International Conference of Local and Regional Authorities committed globally by agreeing on a “Brasilia Local and Regional Governments Call for Action on Water”, encouraging actors to apply 5 recommendations resulting in experiences and lessons learned. The 5 recommendations include, among others, the promotion of urban water resilience, capacity building in water governance, and equity access to balancing quality and quantity for marginalised population. The final Declaration of the World Water Forum encouraged the exchange and sharing of experiences and best practices among national regional and local government representatives, parliamentarians, judges and prosecutors concerning effective and sustainable ways to use water resources, while addressing the three pillars of sustainable development. UCLG will continue strengthening its commitment for local action, together with its international partners, towards the ninth edition of the World Water Forum that will take place in Dakar, Senegal, in 2021.